Grilling salmon on cedar planks is a pretty common thing. I’m not sure why I never thought about cooking burgers on them too, though. Bobby Flay thought about it. That means I had to make them too. 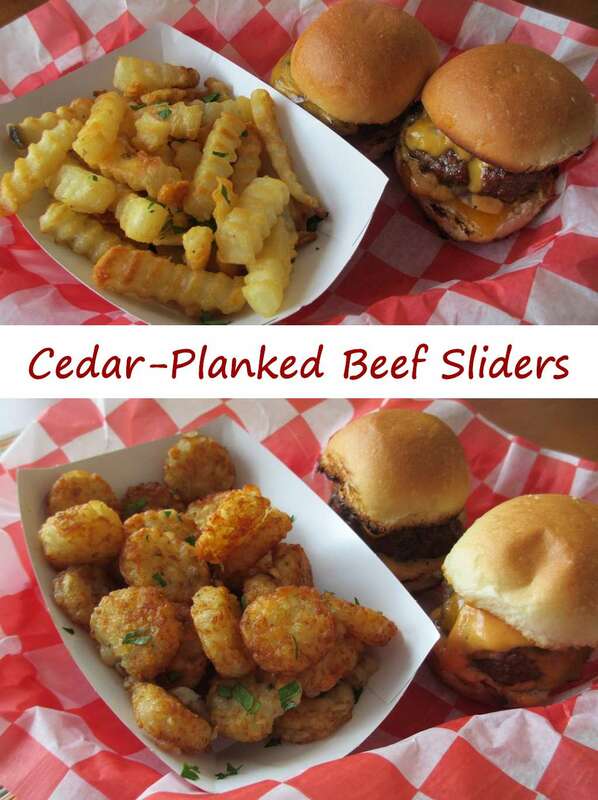 These cedar-planked beef sliders were amazingly good. The cedar adds just a bit of a twist to the burgers. They smell absolutely fantastic when cooking. The cedar flavor in the meat isn’t overwhelming. It’s there, though. It’s definitely something different and it adds a bit of a ‘wow’ factor to your cookout. I also browned my slider buns over the cedar for a little extra cedar flavor. I served these burgers with oven-baked fries and Crispers that were tossed in garlic oil and fresh choppy parsley. Cooking on cedar planks can really change the ordinary into something special, which is why I do it often. Check out my other cedar plank recipes: creamy mashed potatoes, Cajun mashed potatoes, Twinkies, chorizo portabellos, hot dogs, sausage sandwiches, shrimp and grits and spicy grilled shrimp. Place plank over direct heat for 2 minutes. Flip and heat another 2 minutes. Brush top of plank with olive oil and place over indirect heat. Place burgers over direct heat and cook for 3 minutes. Flip and cook another 3 minutes. Transfer burgers to plank. Add cheese and cook until done, about 5 minutes. Slather buns with burger sauce. Add patties and serve. This entry was posted in From the Grill & Smoker, Main Dishes and tagged beef, cedar, Cedar-Planked Beef Sliders, grilled, planks, recipe, sliders by Mike. Bookmark the permalink.